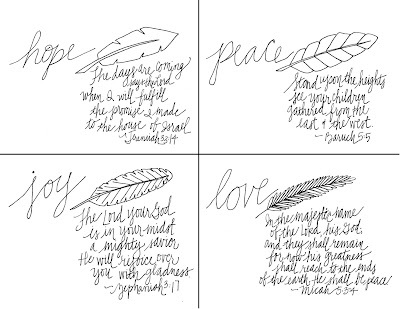 Scripture doodling. That's what I'm calling it anyways. It helps me focus, helps me memorize, and helps me treasure God's Word. I often spend time doodling on Sundays using the Sunday Readings from Mass. Today, as I sat down to pray, I realized that the first Sunday of Advent, the beginning of a new Liturgical Year, is a great time for, well, a new year's resolution. So I've decided to be a little more intentional about this idea. I broke out an unused journal, labeled the top of each page with all the coming Sundays this year, and started today. My goal is to spend time meditating on the Readings for each Sunday for the rest of the year and doodle a selected verse every week. I'll be documenting the journey each Sunday on Instagram using the hashtag #SundayReadingsScriptureDoodle. Come follow along, and jump in if you like! In the meantime, here are four prayer cards for you from the four Sundays of Advent. Each has a verse from the First Reading of that Sunday with a promise from one of the prophets. Feel free to print and color them to help you pray and remember the purpose of this Advent. These are beautiful. I love that this is part of your prayer process. Thanks, Ann! It has good for helping me dwell in Scripture instead of just rushing through a text! Katie, your doodles are so pretty! Thanks, Grete! You're so sweet! I just discovered your blog and I feel like I have died and gone to heaven! I teach Faith Formation at my church and your ideas are exactly what I would come up with if I were creative! Thanks for sharing your gift! Jacquie, welcome! I'm so glad you found me and some good things to use with your Faith Formation kids! Thanks for your kind works!